Annoyingly, these numbers include warm up and cool down because I pulled them from SportTracks' online reporting that doesn't allow reporting by active vs resting laps. But they still show a significant difference from last year to this year. Due to injury, I didn't run at all in the 2 weeks leading up to the 2017 marathon, so I basically stopped the training at 17 weeks instead of the initial 19 scheduled. 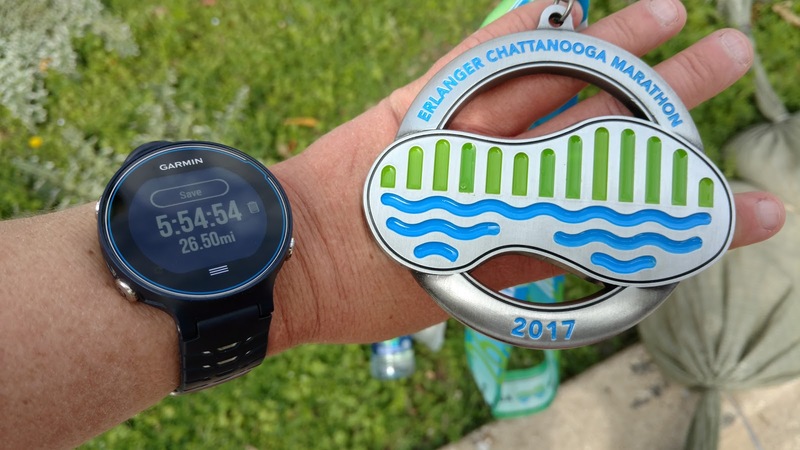 I was much more consistent in my training numbers and my pace this cycle and it paid off with a more consistent performance in the marathon. I was way more sore after this marathon than I was last year. Maybe because I pushed through when I wanted to quit and walk the rest of the way. The day after the marathon in 2016, I felt relatively fine with only minor soreness. This year, it was Friday, 5 days later before I felt that way. This year, I had an ankle injury about 3 weeks before the marathon and only ran twice in that time period. My ankle did bother me some in the marathon, but not enough to quit. In January, I injured my right elbow carrying a heavy hand-held water bottle on the outside of my arm for 9 miles of a tempo run. It never occurred to me to switch hands. Duh. My ankle and elbow didn't bother me enough during the marathon to quit, but a week after the marathon, both were still bothering me after the residual soreness had worn off. So I went to an orthopedic surgeon to get x-rays and an opinion on both. The verdict? Arthritis in my left ankle, along with a small bone spur. The bone spur is likely the cause of the pre-marathon injury. I broke this ankle in 2008 during a horseback riding accident and was subsequently plated and had 3 surgeries on it. The arthritis is not necessarily surprising. Tendinitis in my elbow. The cream they gave me for my elbow reminded me of somebody putting my arm in a fire or on a hot radiator (looking at the brothers here...). But I gritted through that pain because after the cream dried, my elbow felt 100%! Unfortunately, after 3 or 4 uses (2 days), the skin on my elbow looked like it had been burned. I discontinued the medication. I'm debating going back for something else or just wait it out. Not sure where to go from here. I put my self on a mandatory 2 week rest period and when I saw my doctor, I was given another 2 weeks of no running. So I'll likely start back running sometime this week or maybe next. 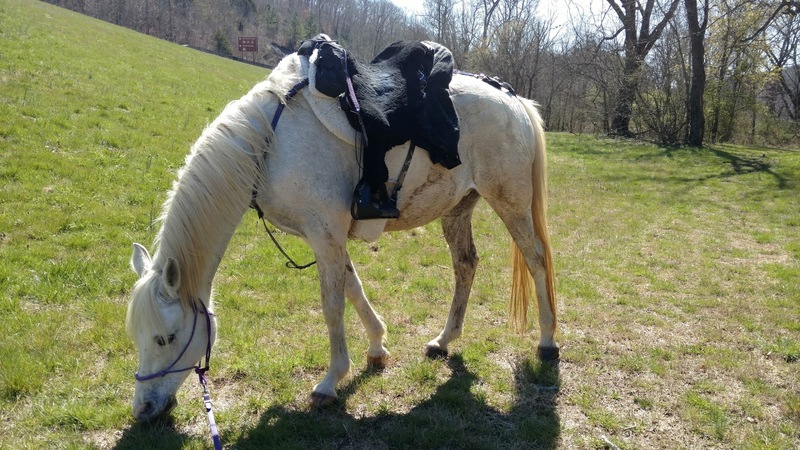 Sasha grazing after a 19 mile training ride. In the meantime, I've been having fun with my endurance horse, Sasha. She has been off work for about 5 1/2 months due to her having an issue at a ride in September, then Tanna getting hurt and taking up a lot of my time and marathon training taking up a lot of my time. I also manage to hold down a full time job. But, now that I'm not running as much, I've started riding Sasha regularly again and having fun with that. Well, I need to start back doing some easy running. 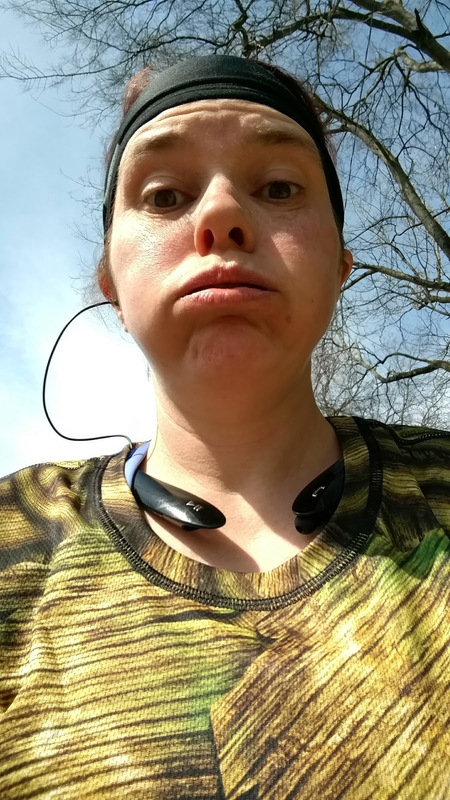 I have a half marathon in mid-April that I may or may not get to. It has a generous time limit of 4 hours, so I could go do it and just lolly-gag around the course. Then I need to figure out a 10k training program for my July 4th 10k. Looking even further ahead, I'll do a 1/2 this fall and then back to training for another marathon for next March. 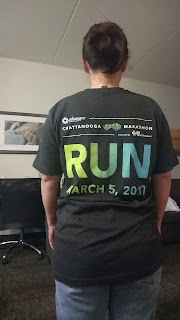 I've signed up for the 2018 Asheville Marathon that is run on the Biltmore Estate in Asheville, NC. More about that as time goes on. Going to get my packet first thing in the morning. My alarm rang at 5:30 AM. I got up, showered, dressed and left my hotel room a little after six. I headed to the elevator banks. I was wearing my 2017 Chattanooga Marathon hoodie I'd purchased online over a short sleeve shirt and a pair of blue jeans. The other occupant of the elevator noticed my jacket and asked what job I was doing for the marathon. I smiled and said I was running it; just had to go get my packet since the Expo closed at 5 PM on Saturday night instead of 7 PM like last year. Since he mistook me for a volunteer, I decided he must be one, so asked his job. He said he was going out to check the course markings to be sure we were not going to have a repeat of the slightly short marathon from last year. I thanked him for that and we parted ways as the elevator opened. 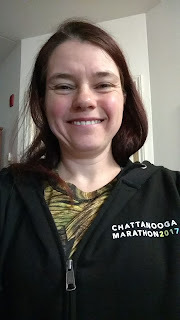 Me in my comfy hoodie before getting ready for the run. 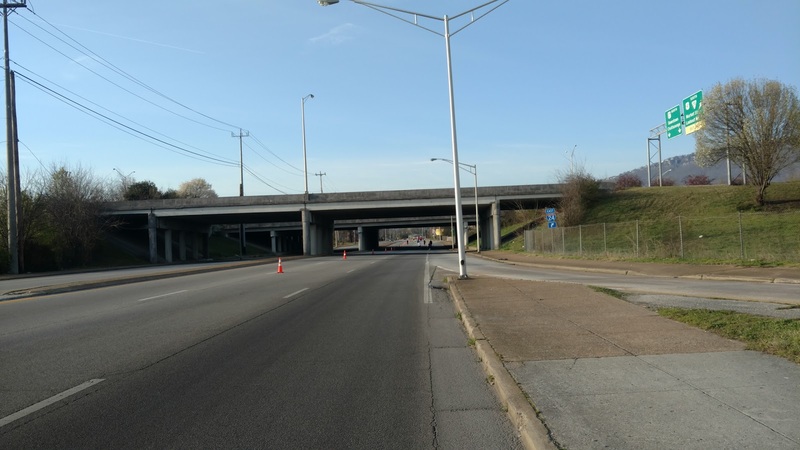 I stepped out into the cool, dark morning on the streets of Chattanooga. 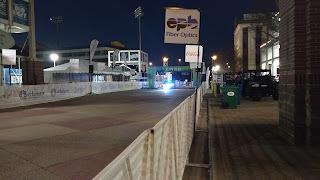 I walked the 1/4 mile or so to the Expo where they were giving out race packets. I got my green backpack bag that held a bunch of Chattanooga information and pamphlets, a gray T-shirt and my race number: 151. I went back to my hotel room and finished getting dressed for the race. 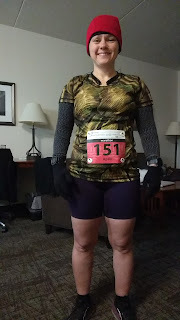 I had gone back on forth on wearing capris or shorts, but with the help of a friend and the fact that it wasn't terribly cold on my walk to get my race packet, I chose the shorts. The news was saying it was 36° outside, but it just didn't feel like it to me. I added arm sleeves (men's dress socks that had the toe cut out) to my short sleeve shirt, a knit hat, knit gloves. I removed the extra material from the bottom of my race bib (meal ticket, bag drop ticket and some other ticket I don't remember now). I had a moment of panic when I realized there were no safety pins! I hadn't remembered to look on the table at the Expo and there were none anywhere in my packet. I did have my Running Buddy Bib Clips in my suitcase though! Yay! I attached my bib to the front of my shirt. Next came my Flip Belt. I added lip stuff, my ID, a credit card, and my truck key to the zippered pocket. Then a zip lock bag with a couple of individually wrapped wipes, a couple of blister band-aids and an extra set of ear buds in case my bluetooth ones decided to stop working. Finally, a picky bar, a pack of cliff shot bloks and a gel. All in the Flip Belt. I flipped it over to secure the openings. I slid my cell phone into the left thigh pocket of my shorts, another picky bar, pack of cliff shot bloks and 2 gels in the other thigh pocket. Finally, I pulled on a sweat shirt I'd picked up new that week off a sale rack. And it was time to go! 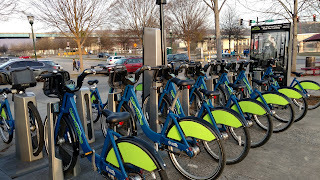 I left the hotel and went to the nearest city bike rack and rode the mile or so to the start line. The bike rack I was planning to return my bike to was full, so I headed to the next closest one and was able to leave it there. My legs were COLD while I was riding the bike, but after that, I wasn't cold at all. 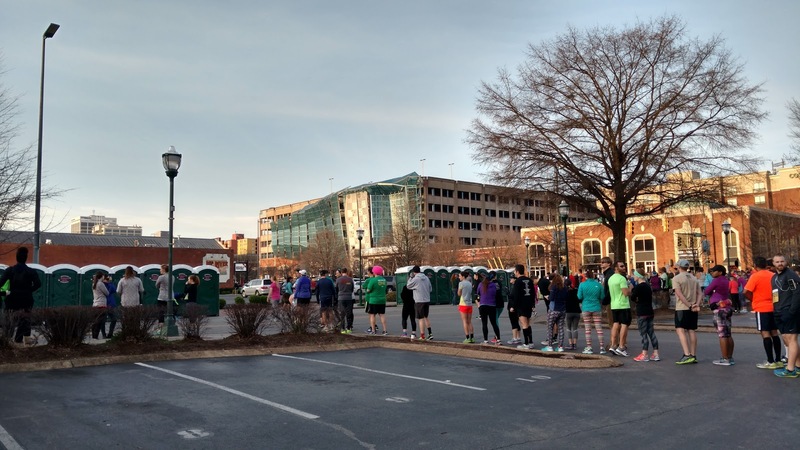 I jogged back to the start line and joined the line for the porta potties. 20 minutes until start time. I like the way people tend to line up for porta potties with 3 or 4 lines spread semi-equi-distant apart and people just go to the next available one between the lines of people on either side of them. Works well and most of the lines go down quickly. I spent my time in line stretching out a bit and fidgeting from excitement. I got to the starting corral about 10 minutes before the start and stood a bit back from the 12:00 pace sign. The marathon and half marathon runners were all starting at the same time. 3 minutes before the start, I removed my sweatshirt and hung it on the corral fence for them to pick up and donate. I had a nice chat with a lady doing her second marathon since 1999. She'd done over 20 though before that! She was very nice. And we were off! Of course, I walked the first minute or 2 with the rest of the crowd. As I approached the start line, I begin running and started my GPS watches. 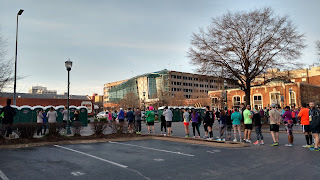 Shortly after the start, I realized I had not taken my pre-race gel, so I pulled it out and did that, veering off course slightly to toss the empty pack into a nearby trash can. We passed a bank that had 48° on its sign. Yeah, happy to have the shorts instead of the heavier capris. 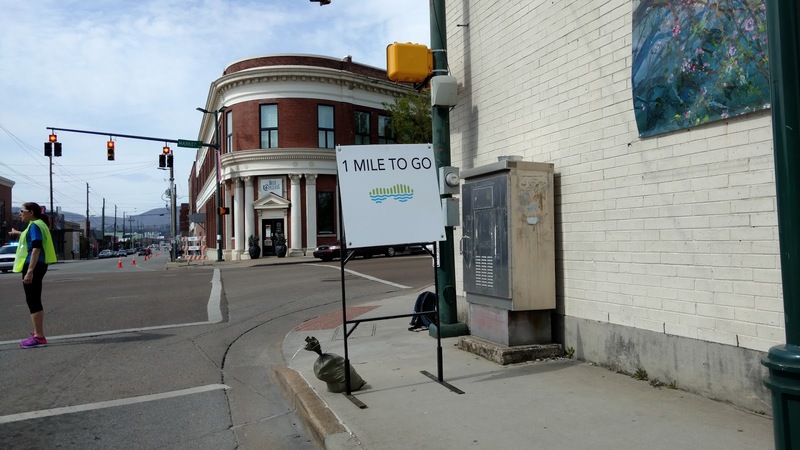 The first mile went pretty well. I was actually a little concerned because I was having no trouble keeping slow enough to keep pace. Usually the excitement of a race pegs my HR and I go too fast. I was worried that wasn't happening. I settled immediately into my 12:30/mi pace. I decided to go with my usual long run routine. Run 12:30/mi pace for 4.5 minutes, walk for 1 minute. Walk uphills, cruise downhill. 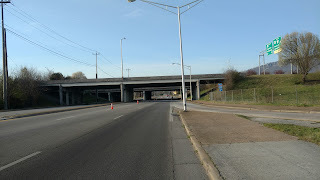 During the second mile, the half marathoners turned right while the marathon course continued under I-24. The field thinned considerably to just the 450 or so marathoners and the marathon relay runners. By the way, that number was down from 2016's numbers of around 575 teams (single or relay). I ran the 3rd mile 50 seconds too fast and dialed it back for the next 2 miles. The course was the same as last year through mile 4, but in the St Elmo neighborhood instead of veering off to Virginia Avenue, the course continued south on Tennessee Avenue before looping back and running back north on Virginia Avenue instead of Alabama Avenue, which was last year. The St Elmo neighborhood had 2 places where streamers were set up across the road for us to run through with people hanging out by them, clapping, cheering with music playing. Very festive. I found it hard to not run too fast with all the encouragement! Just before the 8 mile marker, the course moved to the Tennessee Riverwalk at the South Broad Trailhead. This was a nice change from last year's section up Broadway. 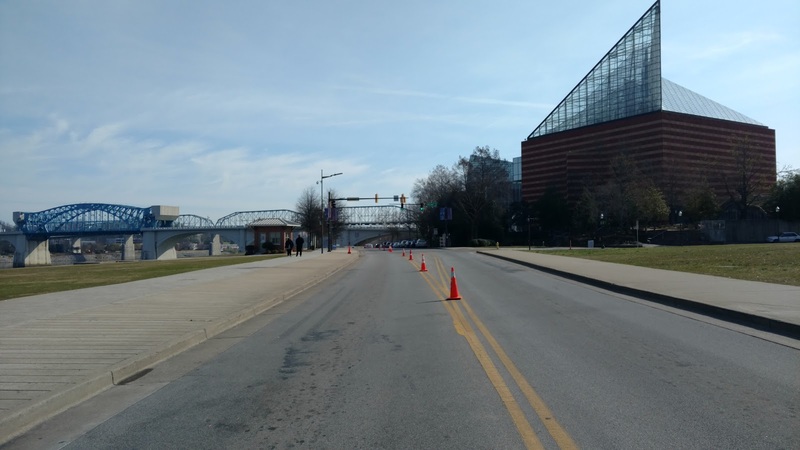 For one thing, by moving to the Riverwalk, we avoided having to run just south of the finish line at mile 9! I did not enjoy doing that last year. Seemed a bit cruel to see the half marathon runners finishing and hearing the cheering and knowing I still had 17+ miles to go! Around this mile also, I began to see the same runners I would see during the remainder of the marathon. In particular, this one guy that was walking. He was going about my average pace of 13:30/mi, but walking the entire thing. So two thoughts went through my head on that score. Good for him! And, boy, I run so slow, people can walk just as fast. :-/ Oh well, keep going! I would run past him and he'd catch me up on my walking breaks. We exchanged a couple of pleasantries, but pretty much lived in our own worlds. By now, it had warmed up nicely. I had dropped my knit hat at the mile 2 aid station and my gloves at the mile 4 aid station. I still had my arm sleeves on, but was starting to move them down my upper arm to expose more skin. I was feeling pretty good at this point. Keeping to my plan. Eating on time. I'd even taken a Snickers bar at mile 4 and a Twix at mile 10. No real issues to complain about. 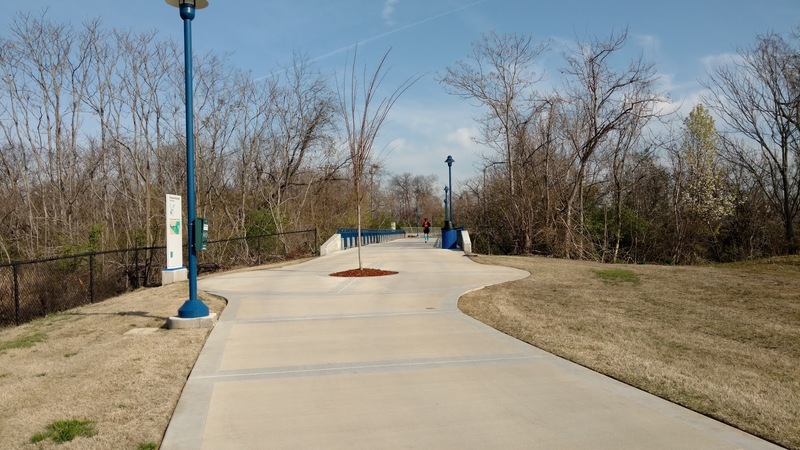 A beautiful day, great volunteers, a perfect day for a run. sleeves there, so just running in shorts and a t-shirt. It felt great. 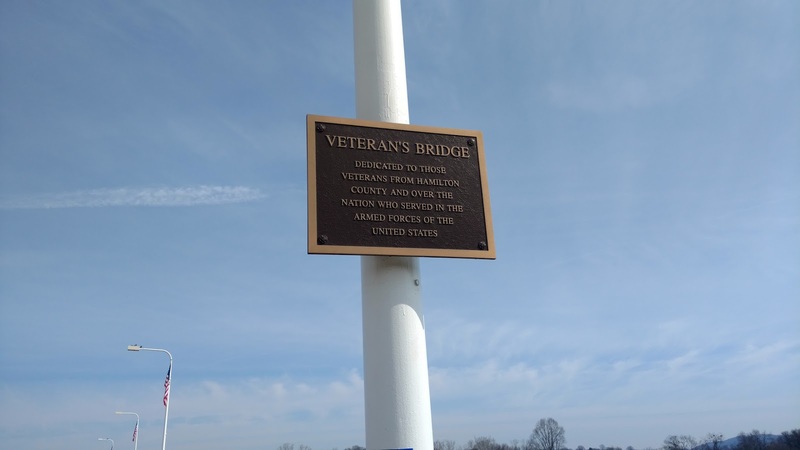 Crossing over the bridge, we continued into the hills. This is when the hills really started in earnest. Or at least when I really started feeling them. 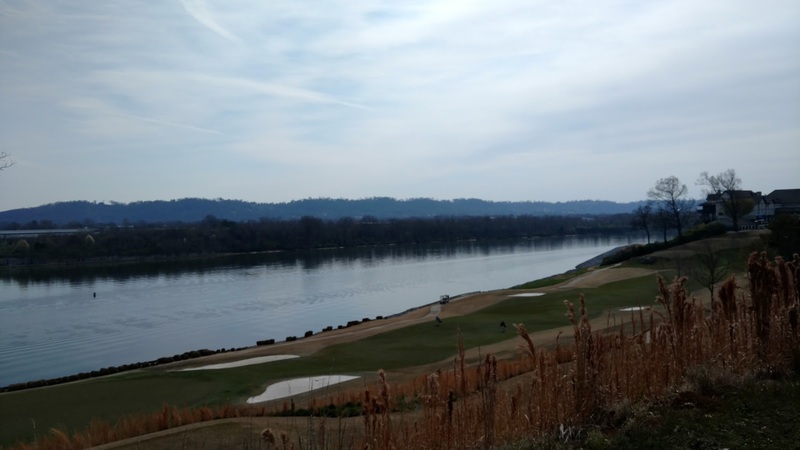 The course went north on Barton Avenue and then looped back by the Chattanooga Country Club and curved under Veteran's Bridge. View of the Country Club golf course from the top of a hill. At the mile 16 aid station, I paused at the aid station and about fell over! Suddenly stopping made me feel like I'd just gotten off a ship I'd been on for days. But I managed to not fall down. I took a Snickers bar and continued on. But this time, my stomach said NO to the Snickers. I had to spit half of it out. I managed to keep the rest down, but nope, not planning on eating Snickers in the latter part of a run anymore. I was a little worried the next time I was due for a gel, but my regular Caramel Machiatto Gu went down without a hitch. Even though I walked the hills and ran down them, they were starting to take their toll. That or just the cumulative mileage. I was experiencing some leg and foot pain by mile 15. Not debilitating, but not comfortable either. I paused and stretched every 3 or so miles from here on out. The course crossed back to the south side of the Tennessee River over the pedestrian Walnut Street Bridge, then through the University of Tennessee campus, where there was a live band. By this time, I'm at mile 19 and wondering if I'll finish at all, but still hitting my paces, even with my bathroom and aid station breaks. By mile 15 last year, I was already letting my paces slip, with only 2 miles out of the last 11 hitting my pace. 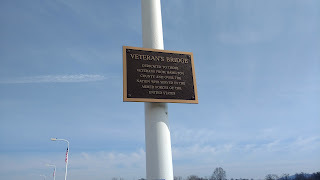 After mile 21, though, I had something else to think about since the course was different. Instead of running up by the zoo and then running by the Chattanooga National Cemetery along Holtzclaw, we ran along Kirby Avenue and south on Highland Park Avenue. Finally, I came out on Main Street, headed west. Mile 24. 2.2 miles left. I was fighting for every running segment. Almost crying when I'd walk and dreading the next running section. I flipped my GPS to show me how long I had to run before I could walk again and then flipped it away because I really didn't want to know. I just listened for that beep. Each time I walked, I wasn't sure I would run again. I kept thinking, I can just walk now. I've already done better than last year. It's ok, just walk. But somehow I reached down and ran when it was time to run. But it hurt. My music really helped me here. I could run to the beat. My training really helped me here because when I ran, I was running my 12:30/mi pace. Because I'd run that so much in training it was automatic. 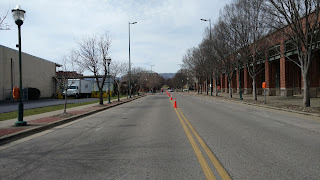 Finally, I turned off Main Street to swing up to 13th Street and to the final turn of the marathon. Approaching the last turn; about 1/2 mile from the finish. 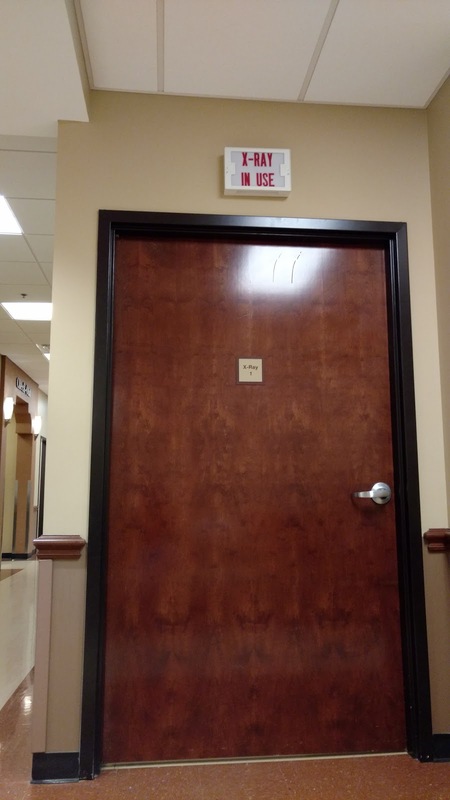 I turned the corner. I could see the finish line. And yet, I could not run. I could not convince my legs to run. I picked out landmarks and said, ok, start running here. And I didn't. So picked another one. And didn't run. 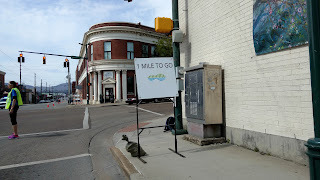 Finally, though, I saw the 13 mile sign for the half marathon. Only a tenth of a mile to go. I can do that. So I did. I began to run again. There was a cop at the end of the finish chute and he high fived me and encouraged me on. So I ran. The announcer announced my name and as he did I raised my hands above my head and yelled in victory. Just a few more steps and across the finish line. Whooohoooo!!! Second marathon down in 5 hours 54 minutes and 45 seconds (official chip time). A 20 minute PR. GPS time and completely AWESOME medal!! And it hurt. It hurt a lot. I got my medal and a bottle of water and headed back toward my hotel, whimpering with every step. My legs were hurting, my arms were hurting, my back hurt. But I had that cool medal! And I was done! 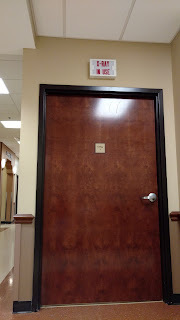 I reached my hotel and decided to take the stairs because they were closer to my room. And was shocked at how much my quads hurt when I tried to climb those stairs. I paused and thought but decided, yes, up the stairs. I grabbed the railing and hauled myself up the stairs with every painful step. Yes, yes, I do this for fun...??? Or maybe just to see how tough I really am, or am not. But I did it! I finished and finished fairly strong, the walking during the last 1/2 mile aside. All but 2 of my mile splits were no slower than 20 seconds off my target pace. And those 2 were 14-minute miles and both of those were miles with restroom breaks. My splits were fairly consistent which makes me happy. I trained for consistency and that's what I got. This was a great course this year. I was super happy to get a PR, but the course was interesting as well. The volunteers were top-notch with lots of cheerleaders, even in the later part of the course for me as a slower runner. The weather was perfect for me as well. The shirts are great and the medal is very cool. During the run and for the first 2-3 days after, I was thinking I wouldn't do another marathon. Now, I'm thinking maybe I will. I don't know that I'll get faster. I'm just not fast at all. It's a lot to run for almost 6 hours. It's a lot of training to be able to do so. I don't know. I have a couple of marathons in mind for 2018. I can't do both because they are only a week or two apart. So I will probably train for the harder one and have the easier one as a back up if my training goes badly. But for now, I'm going to enjoy the feeling of having completed marathons! And turn my attention to my endurance mare, Sasha, and get her ready for her own distance events. 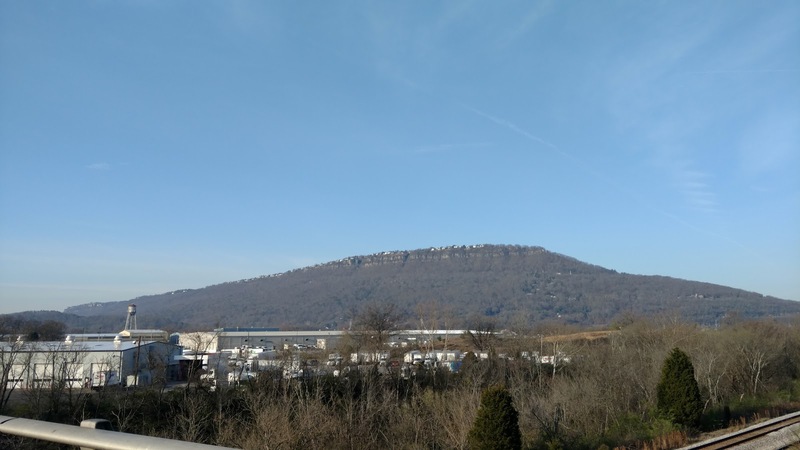 The weather for this year's Chattanooga Marathon is looking very much like the weather last year. 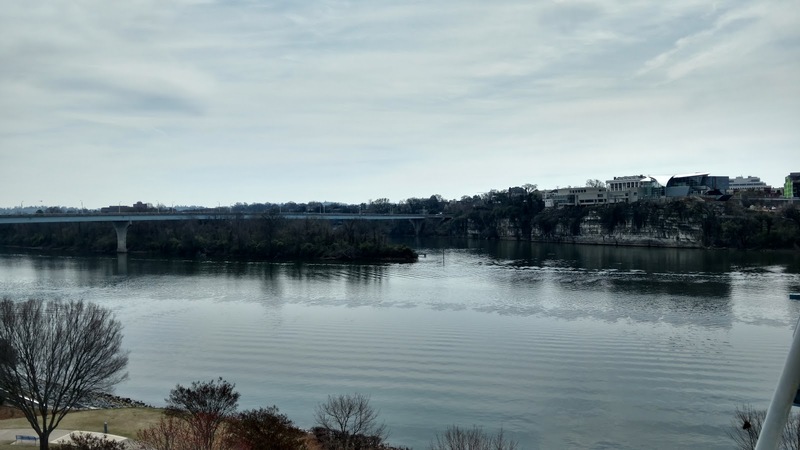 High 30s for the start, warming into the low 60s by the finish. I have tentatively picked out the clothes I will wear and have packed them. I also packed a pair of shorts and a pair of winter tights just in case the weather changes at the last minute. I have confirmed my hotel reservation. I have packed the gear and food I will use during the race. Last year, I used an Amphipod hydration belt with a couple of water bottles. This year, I'm going with my trusty Nathan soft flask hand held and a FlipBelt with a zipper pocket for my phone. And, of course, I'll be running with my Forerunner 630 and Forerunner 620 watches. Before I tweaked my ankle, I had a different race strategy. Now my strategy is to get through it. I'm going to approach it like any other long run, with a long run pace instead of my marathon pace. Walk the uphills. I'll be thrilled with a finish. A strong finish without having to only walk the last 2 miles would be even better.